Vibert was an Officer of the Legion of Honor and one of the most sought after atelier masters at the Ecole des Beaux Arts. He was a witty French Academic painter who exercised his artistic freedom by poking fun at human foibles, mocking greedy government, and challenging hypocritical clergy. Images that would have led to imprisonment a decade earlier were viewed as a part of the growing democratization of Europe and made him a much-admired artist in his native country as well as in America. 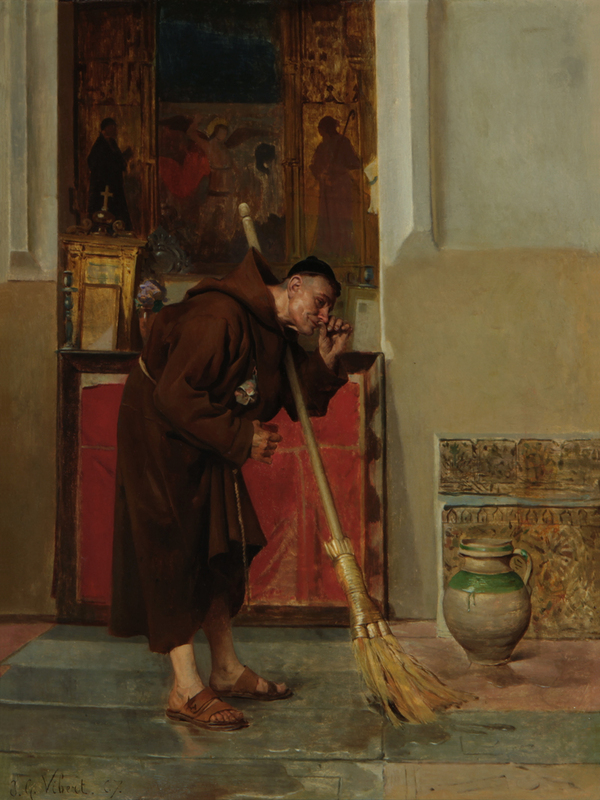 In describing Jehan Georges Vibert, an admirer of his wrote this: “One of the most original artists that Le Roux introduced to me is Vibert [.] He is middle-sized, stout for his age, — for he seems only thirty-five, — has a full, merry, happy, but very shrewd, sensible face; he loves work, and is, as are all these men, an indefatigable, untiring worker, but he loves also to take his play-hours. In the evening he goes to the, theater, and among his friends and himself removes his thoughts from his work and his studio.”The cheerfulness, playfulness, and hint of shrewdness she describes in Vibert’s character are traits that would also distinguish his works and make his reputation. He was born on September 30th , 1840 in France. In his early years he was trained under Barrias and on April 4th, 1857, entered the Ecole des Beaux Arts. During the early part of his career he painted rather serious and dramatic subjects, such as “The Death of Narcissus” and “Christian Martyrs in the Lion pit.” He entered the Salon in 1863; found his first success with a medal at the 1864 salon, and won a financial prize at the universal exposition of 1867. Around 1867, however, his style changed and instead of the dramatic and serious, he started painting “small things and niggling.” Instead of heroic Christians and tragic mythology, he turned to more homey subjects such as The Barber of Ambulart. In 1870, while Paris was under siege to the Prussians, Vibert fought and was wounded at the battle of Malmaison. His courage, though, earned him the honor of being made a Knight of the Legion of Honor. Though he was himself a hero, his growing attraction to the less serious subjects of genre did not ebb. Instead, it was stimulated by his interests in comedy and satire. Not only did he enjoy taking a break from work to go out to plays, but he also wrote several comedies, many of which were successfully produced at Paris theaters such as the Vaudeville. As well as from his own comedies, he gathered subject matter from the French fabulist Lafontaine (of whom he had a bust in his house), and the satirist Jonathan Swift. In 1878 he achieved his first popular success with a huge history painting. “The Apotheosis of Mr. Thiers” was the talk of Paris even before it was completed. However, in spite of the success of this painting, he would spend most of his creative time on the humorous scenes that he enjoyed. During the later part of his life, his interest turned to the clergy. Paintings such as The Fortune Teller, The Diet, and Monk picking radishes satirized the clergy’s irreligious indulgences or depicted them in homey situations to an audience used to seeing the church ennobled in traditional religious and historic works. These would be the paintings that would make his reputation. In 1882, he was promoted to Officer of the Legion of Honor, for his painting this time. This growing reputation would make him one the the most sought after atelier masters at the Ecole des Beaux Arts. This would lead him to being one of the seven most influential artists of his time, along with Bouguereau, Cabanel, Meissonnier, Gérôme, Bonnat, and Lefebvre. He died suddenly of heart disease on July 28th 1902. “The Fortune Teller (Tireuse des Cartes) is a particularly powerful example. What could be a greater spoof on holier-than-thou clerics, than to have two Cardinals soliciting the services of a prognosticator.” In a late ninteenth century society that was still bearing the fruit of the Enlightenment, it is no wonder that Vibert’s wit and satire could flourish and be valued. In 1902 an important technical book was published by Vibert call La Science de la Peinture. Very hard to find, this book is one of several from the period that is widely sought by contemporary realists who are trying to resuscitate the techniques and accomplishments of the past, so that future creativity and experimentation can be built on the solid foundation of the masters. Footnote 1: Letter from Mrs. Brewster of Rome. Artists of the Nineteenth Century and Their Works. Clara Erskine Clement and Lawrence Hutton. 1969 (originally 1877), North Point Inc., St. Louis. Footnote 2: Bryan’s Dictionary of Painters and Engravers. M. Bryan. 1910, George Bell and Sons, London.